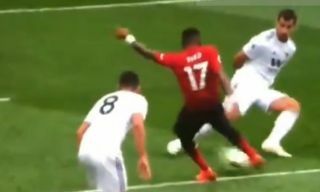 Here’s the Fred goal video as Manchester United have taken an early lead against Wolves, but the special thing here is the touch from Paul Pogba to set it up. Just watch below as the France international plays a sublime first-time, no-look little flick around a defender for Fred to race on to and drill into the bottom corner without needing to break his stride. This is the kind of thing United fans want to be seeing from Pogba, who hasn’t always shown this kind of class in his time at Old Trafford so far. After two goals in midweek and now this excellent assist, perhaps Pogba is finally turning a corner…?